On our last day I was collected once more and taken to the dentists, leaving my husband to visit an internet cafe and talk to a new friend. When I got back we had lunch at a very stylish place called Avocado, before being whisked off to the airport, and flying back on a BEA plane with a friendly crew and a pilot who made jokes. It was a good flight, but we had to circle round Heathrow for half an hour before we could land, and the airport was chaotic. We eventually got home past midnight. It is nice to go away, but always nice to return home afterwards. We walked across the Elisabeth Bridge and called into the Gellért Hotel and had a coffee there. This spa is inside the hotel which is the oldest thermal hotel in Hungary, the spa and pools are extremely luxurious and decorated in an art nuveau style. The hot healing waters have been flowing for 2000 years. 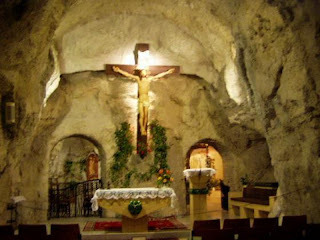 We then went to The Cave Church inside St Gellért’s Hill. This was founded in 1924 using St. Iváns cave (he had been a hermit living there in earlier times). Entrance to the Cave Church . In January 2007 another cave system was found in this area it is 60m long by 18m deep in 3 rooms whose interior is covered in dazzling white crystals of gypsum, calcite and aragonite. These were immediately placed under legal protection. Later we had lunch at the For Sale Pub, which from the outside looks like a feathered nest as it is lined with notes that have been attached to walls and ceiling. There is straw on the floors mixed with peanut shells as peanuts are provided on every table. The food is very good there, and reasonable. Labels: Cave Church, For Sale Pub. While in Budapest we went as arranged to the dentists. They collected us from the airport, and from the hotel for each dental session and were very efficient and friendly. When it was time for us to go home, the dental office arranged a taxi for us to drive back to the airport. These extra services were provided with no extra costs, and if we had asked they would have booked hotel accommodation for us with a concessionary rate as we were their patients. We did a lot of window shopping while there and saw the Jules Verne submarine restaurant and bar which reminded us of the film Brasil. Later we took a final tram ride along the Danube before going back to the hotel where children were performing folk dances to gypsey music in the restaurant. After visiting an internet café we took the Metro to Mexikoí út and walked across the park to Vajdahunyad Castle and looked around the impressive buildings and lake. we liked this statue called Annonymous which was in the grounds. Later we walked to Heros' Square and had coffee there. After a meal in a Kínai Büfé (Chinese Buffet) we went to Fat Mo’s speakeasy music club, in a cellar, for a glass of wine. The staff were very friendly, and the display shelves and optics were being scrupulously cleaned and polished by the bar staff. Later we strolled around town, and admired the Market Building before going back to the hotel. We have recently visited Budapest, we have been once before, but this time we were situated downtown beside the Danube. The weather was warm, and we spent time traveling all over the city by bus, tram and the Metro. In this way we explored Budapest without risking life or limb by driving. As it was so mild the pavement cafes were in use by day and night. While we were in Budapest there was an International Congress for the New Evangelisation so various Christian denominations were competing to broadcast their messages and all the churches were open and giving concerts and services, with some enthusiastic gatherings being held in the open so the air was filled with music. St Stephen's Basilika. One of St. Stephen's cut off mumified hands is kept here as a relic. Later we went to the theatre and saw a musical called Menyasszonytánc, which had subtitles above, but most impressively there was a lady signing so that any deaf people would be able to follow what was going on. The show was very lively, with energetic Klesmer music, and ended on a very feel-good note. Next we had a meal at the Komedias Kaveház, where there is a jazz pianist.